Looking for help with some of your biggest production challenges? Our Grower Day (June 19 in St. Catharines) can help. 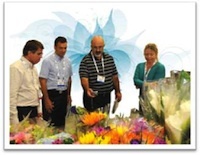 Flower containers made of a new “green” bio-plastic material will soon be on the market. Phoenix Perennials is not shy with its gardening promotion efforts. It was selected as the winner in the category of “Growing Gardeners” at the Chrysler Garden Centre of the Year Awards for their efforts in 2012. OMAFRA in conjunction with Vineland Research and Innovation Centre, University of Guelph and Flowers Canada Ontario Inc. will be holding a meeting to discuss options for whitefly control in poinsettias for the coming season.